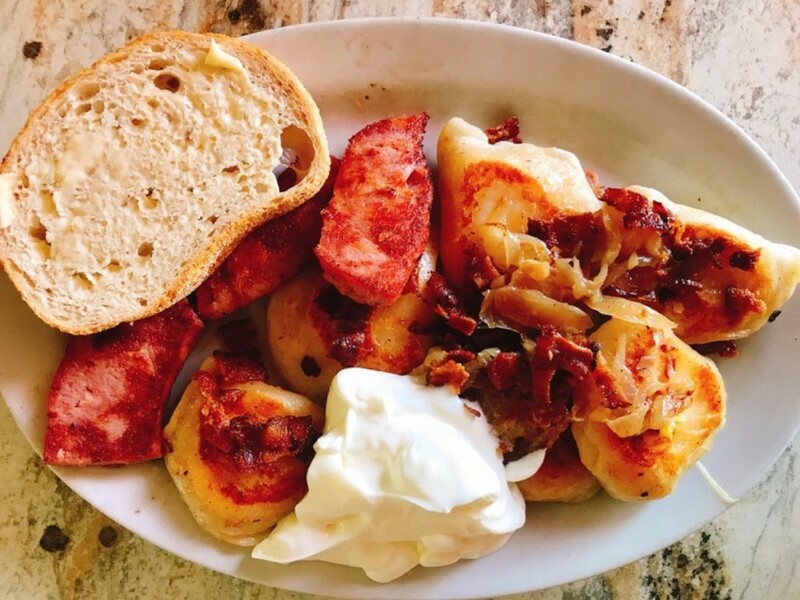 Walking into Luda’s Deli for lunch is a lot like walking into your Ukrainian grandmother’s house—you’ll be greeted by name, told to help yourself to coffee and water, fussed over, and fed incredibly hearty, home cooked meals from an unbelievably tiny kitchen. Here, you’ll find nothing fancy but everything tasty. This delightful little 40-seat diner sits at the corner of Aberdeen Ave. and Salter St. in Winnipeg’s North End, where owner Tracy Konopada and daughter Kristi have been serving up breakfast and lunch classics for more than 30 years. Some of these classics include Luda’s ‘Famous Reuben’, a grilled corned beef sandwich served on grilled pumpernickel bread with sauerkraut, melted Swiss cheese, Thousand Island dressing and mild mustard, and the Monte Cristo sandwich with Texas-style bread dipped in an egg mixture and grilled with ham, turkey, and melted Swiss cheese. Best of all, Luda’s hot sandwiches use fresh bread from Gunn’s Bakery, another North End staple located just a block away on Selkirk Ave. The ‘North End style’ perogies are another Luda’s specialty, served with fried onions, sour cream, kubasa, and stuffed with sharp cheddar cheese and potato (at any point during the day, you can catch Kristi or Tracy mashing impressive amounts of the stuff in between serving tables, chatting with regulars, and expertly dancing around each other in the kitchen as they cook up orders). While here, you’ll also want to try a bowl of the borscht, widely considered the best in the city. As with many of the city’s hidden culinary gems (and boy, do we have some gems), Luda’s has a large, loyal fan base—the deli boasts almost 200 reviews online (almost all of which are five stars), and has even become a favourite spot for notable chefs to chow down when they’re in town including Scott Vivian (chef/owner of Beast restaurant in Toronto) and Ryan Lachaine (executive chef/partner at Riel restaurant in Houston, TX). Watching a finely tuned machine run by people who truly enjoy what they do is one of my favourite things. Passion is contagious and inspiration is everywhere. Wood paneled walls, cozy corner tables, and a bright bar top overlooking the kitchen and a large front window contribute to the deli’s cabin-like interior, making the space incredibly charming and warmly welcoming. Even visiting for the first time feels familiar. Luda’s is open Monday to Friday (and Saturdays starting after Thanksgiving) from 7:00 am to 1:30 pm. The restaurant is cash only, so make sure you bring some dough (money) if you want some dough (perogies). And, as you finish your plate (or two or three, we’re not judging), it’s not unusual to hear, “did that hit the spot, Hon?” from one of the lovely ladies in the kitchen.